The crew team explains the joy of those predawn practices. 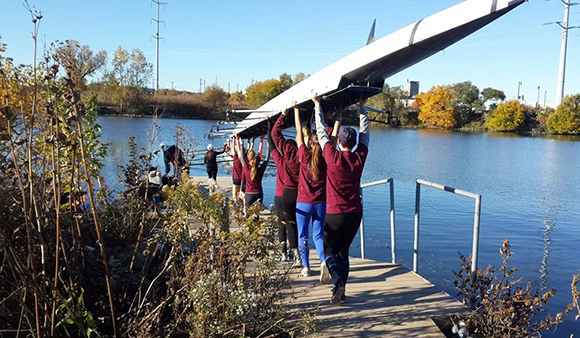 The University of Chicago crew team is coming off some remarkable successes in 2015. The women’s team placed fifth in its class at the Head of the Charles regatta in Boston, and the men’s team placed third in its class at the Head of the Hooch in Chattanooga, Tennessee. The 55-member coed team practices in the early morning five to six days a week—on the Chicago River if the weather is at all decent, on rowing machines in the Henry Crown Field House otherwise. 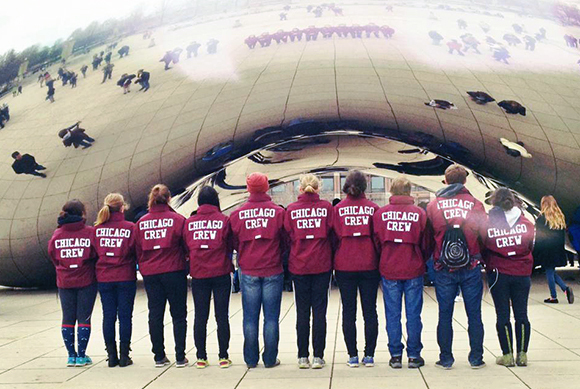 As a club sport, the crew team is responsible for raising its own funds and hiring its own coaches. The Core spoke with team president Mark Sands, Class of 2016, and head coach Patricia Brubaker. How did you become involved in crew? Sands: I wanted to do something athletic in college, but I have no eye-hand coordination. I can’t catch balls, and I can’t throw them. So I tried pulling on an oar for a while, and that wasn’t quite right, either. Now I’m a coxswain—I steer and try to be loud and motivating. Brubaker: I took up rowing after college. I went to DePaul and just wanted to focus on school. Although I shouldn’t say that, because I want students here at Chicago to build it into their lives. What about crew makes you say, “I totally want to get up at 5 a.m. to do this”? Sands: Passing other boats! That’s the most exhilarating feeling. Brubaker: I like winning. And I like that it’s a sport that you can excel at at any level. There’s room for anybody. What do you look for when recruiting team members? Brubaker: Someone who’s going to make the commitment. A lot of coaches will tell you height or something like that. Really, I don’t care. I see a lot of little people do really well, and not just in the coxswain’s seat. Crew is one of the most physically demanding sports you can do. It’s not like running, where you run as a child—there’s nothing natural about the movement. Everyone’s starting from zero. There are genetic gifts, but the most important thing is the desire, the commitment to do it. Sands: As a teammate you want someone who you can trust is pulling as hard as they can. Everyone has to do their role and be dedicated to it. I feel like everything else follows from that. You practice on the notoriously polluted Chicago River. If you fall in, is it instant death, or is it more of a slow, painful death? Brubaker: We’d take you to the ER. Sands: We’ve only had one or two people fall in that I can think of. But I’ve definitely heard about people getting tetanus boosters. Bubbly Creek* lives up to its name. Earlier this year, you took part in the Traversée de Paris, an exhibition race on the Seine. What was that like? Brubaker: Crews from all over Europe go, but we were the only American team. Sands: The Seine is only open for rowing one day a year. 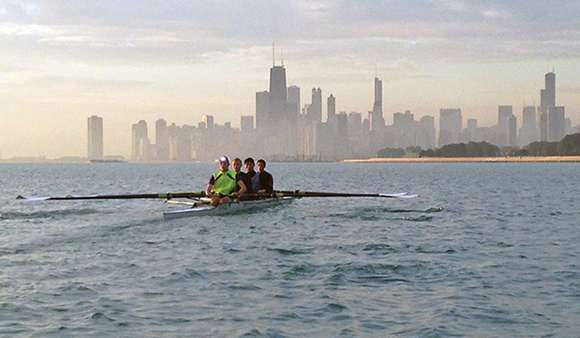 We sent four rowers and a coxswain—myself—to represent UChicago and the United States. It was an astounding experience. I studied in Paris before, but the city looks completely different from the water. Brubaker: So UChicago crew is an expanding experience. I never thought about it that way until now. *A stagnant, polluted spur of the South Branch of the Chicago River, so called from the bubbles still rising up from decomposing animal carcasses dumped there during the days of the Union Stock Yards.